Do you face difficulties in providing more accurate reporting and analysis?Are you unable to identify the latest trends, market conditions and respond quickly to change? Having problems in optimizing internal business process and driving decisions? What about obtaining important business reports? Is it challenging to convert raw data into actionable insights? If yes, then this blog is definitely for you! Well, if you are using Excel, it may be difficult to work with the large data which ultimately creates roadblocks for data-driven enterprises. And if you are using any other tools which have fewer competencies, it may be difficult to harness data for driving the business decision. So, how to make an informed decision with the use of data? Well, in such a scenario, the powerful Business Intelligence system can come to rescue. Gartner has recognized Microsoft as a leader in Analytics and BI platforms for 11 consecutive years. Why do organizations prefer to use Power BI? Before going in-depth let’s start with basics. Power BI is a cloud-based business analytics service by Microsoft enabling anyone to visualize and analyze data with greater speed, efficiency, and high understanding. Is an interactive data visualization tool which makes it easy to share data across the organization. Transforms raw and unprocessed data into insightful and stunning visuals for officials to communicate and understand the business better. Provides access to the customized reports and interactive dashboards which help to have a complete 360-degree view of the business. Companies like Dell, Wipro, Metro Bank PLC, Edsby, Oraylis, Vizion solutions and many more are already using Power BI to grow their businesses. Who Can Use Power BI? – Embed stunning visuals in apps, portals, websites, etc. But, How Professionals Can Have Access To This Tool? Power BI Desktop: You can connect to data through multiple data sources, combine them into a data model and create compelling visuals. Power BI Service: It is a cloud-based, online service for collaboration with the teams and corporations. The reports created in Power BI desktop can be shared in Power BI service, where you can continue modifying them. You can also create dashboards based on your reports in Power BI service. Power BI Mobile Apps: Power BI offers a set of mobile apps for iOS, Android and Windows 10 mobile devices, where you can view, interact and securely access reports, dashboards, and other data on the go — all in one app. To be precise, the desktop is for creating content; the Service is for sharing the content; the mobile apps are for getting insights anywhere on any device. To understand in a better way, you need to know the Power BI architecture. But before that, you must be aware of Power BI components. Power BI is a combination of components where each component plays an important part in Power BI solution. Power Query: Facilitates data search capabilities and transform & merge data from multiple data sources. Power Pivot: In-memory data modeling component which enables highly-compressed data storage and extremely fast aggregation and calculation. Power View: An interactive visualization tool which enables drag-and-drop interface to the users. Data Management Gateway: By using this component you get periodic data refreshers and data feeds. Data Catalog: User can easily discover and reuse queries using Data Catalog. Metadata can be facilitated for search functionality. Power BI can connect data from a variety of data sources. (2) Using the Direct Query. If you are importing a file to Power BI, it limits the data sets to 1 GB, but if the size is more than 1 GB, you can use Direct Query (you can build reports based on extremely large datasets). Once the data is connected, you can transform it as per your needs. Transforming data includes changing the name of columns or tables, modifying the text to numbers, removing rows, adjusting rows, headers and much more. There is a number of transformation options available to shape your data. Here reports are created which represent different findings and insights from that dataset. Basically, it is in the form of a graph, pie-charts, slicers, etc. It is highly interactive and customizable; which updates as the underlying data changes. After creating a report, you can publish them to Power BI services. 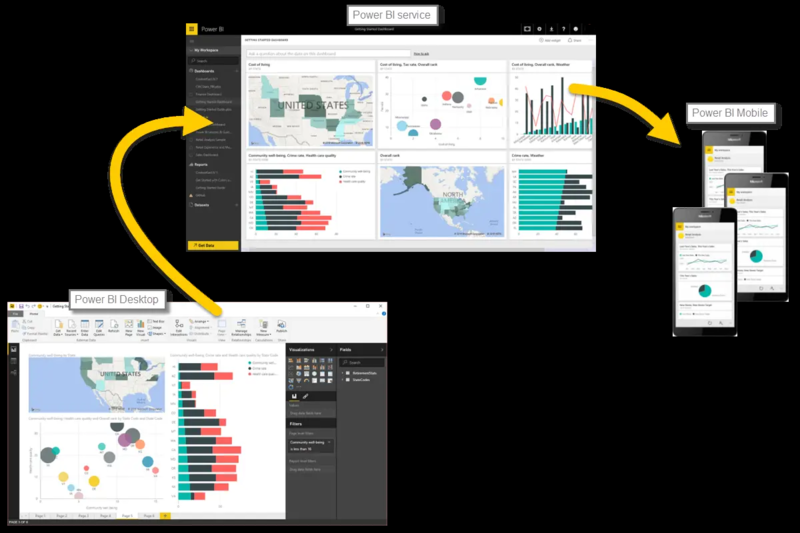 A power BI dashboard consists of a single page, often called canvas that tells a story through visualizations. You can create a dashboard by pinning the individual element or live report page. As it is limited to one page, a well-designed dashboard contains only the overview. Power BI: How It Can Be A Game-Changer For Enterprise? Power BI makes it easy to fetch data from the cloud services including Microsoft Dynamics, Salesforce, Google Analytics, Zen desk, Facebook and more. No matter where your data is available, power BI enables to shape the data from different sources; enabling you to create visual reports that you can easily share with others. With Power BI, you can create personalized dashboards enabling it to monitor the business needs in real-time. It makes easy to solve the problems as they occur and provides a holistic view of the business empowering the teams to make informed decisions. You can easily embed the dashboards and BI reports in the applications to provide the unified user experience. How about asking queries in natural language and getting answers in stunning interactive visualization? Well, with Power BI, you can ask a question and get an answer in the form of right chart and right graph. It has auto-search functionality which lets you scan the hidden insights in seconds. It stores all the information in a centralized location and makes interaction with fast and quick data. The timeline storyteller is one of the trending custom visuals in Power BI that convey information and details that vary over time. It presents data in the form of circle, grids, spirals or any custom shapes, or even a simple linear list. It also has layouts, different scale representation like logarithmic and relative, controls for filtering, highlighting and annotation. You can decide how you want your data to be represented, scaled and designed in a timeline. Power BI offers native BI mobile apps for Android, iOS and Windows where anyone can securely access and view live Power BI dashboards and reports on any device. It is easy to access on-premise data stored in SQL server or data in the cloud; no matter wherever you are. Although Power BI shapes the business world and offers numerous advantages but with every advantage, there is always a corresponding disadvantage. Dashboards and reports can only be shared with users who have the same email domains or email domains listed with your Office 365 tenant. The list of Power BI components is very long and sometimes it becomes difficult to understand which component is required. Although, Power BI has few disadvantages; its unique features and functionalities are aligned with the business decisions. Thus it is loved by most of the organizations. How Power BI Is Different From Other BI Tools? To simplify this, let’s compare Power BI with Tableau and QlikView which are the industry-leading BI tools. Tableau doesn’t have a free version. The Personal version of Tableau cost $420 and the Professional version will cost you $840 annually. Whereas, the PRO version of Power BI will only $120 but the free version itself covers a lot more than Tableau. QlikView doesn’t support Predictive Analytics which makes it difficult to make data-based decisions whereas Power BI can help you to create predictive models and with the content pack of Power BI, you can visualize the predictive results. Easy to configure and can be viewed anywhere on any device. Most importantly, it should have the features and functionalities that enable to make quick business decisions. And Power BI fits all these criteria. So, of-course future holds the best for Power BI and it is here to stay for many more years ahead. What is your opinion? Do you think businesses should use Power BI? Please express your opinion below or connect with us to know more about Power BI. Microsoft Power BI In 10 Minutes [Quick Guide] was originally published in Hacker Noon on Medium, where people are continuing the conversation by highlighting and responding to this story.